TLC and Nelly can rest easy. Embarking on a summer tour with New Kids on the Block, they'll have plenty of good times, but they won't have to worry about watching their backs. "We don't prank," Joey McIntyre explains. "I think everyone is afraid of pranking because if you prank, you're gonna get pranked back. I don't think anyone wants to make that first move." That's not to say that the boys from Boston don't have fun on and off stage. In fact, the guys tell PEOPLE that sometimes they have too much fun. "We're a bunch of court jesters," Donnie Wahlberg says. "We pass the buffoon baton. I'll be a buffoon for an hour and I'll retire, and Joe shows up and all of a sudden be running off jokes, and then Jordan [Knight] will come up. There's always someone who picks up the slack." Sure, they razz each other, as Jonathan Knight puts it, "to keep each other in check." Really, though, they all have a brotherly relationship and they seem to genuinely enjoy being around each other. The merriment will be on full display at The Forum in Los Angeles on Saturday as the guys continue on their 2015 The Main Event Tour, which kicked off at Las Vegas's Mandalay Bay last Friday. 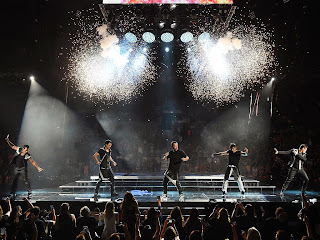 And, for anyone who can't get to their local venue to see the show, they can live stream NKOTB's concert on May 14 at American Airlines Arena in Dallas on the Live Nation channel on Yahoo. "The fans are on a journey," Jordan Knight said of the group's relationship with their diehard fans. "We're all on a journey. They've been with us since we were teenagers. We're just looking to do right by them and give them a good show." The Main Event starts tonight!